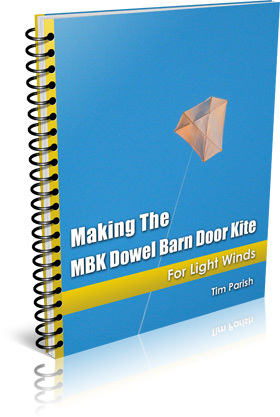 The MBK Barn Door Kite - Light Wind Version. I often pull the big Barn Door kite out when the winds seem a bit too boisterous for my other light-wind kites! The 3 spars and 3-point bridle combine to prevent excessive bending in conditions that would test light-wind Sleds or Diamonds. Even so, this kite still turns in some delightful flying in quite light winds. An American classic from decades past, most onlookers will find the kite mildly interesting because they have never seen a Barn Door before. It's fun to fly this kite on a long line. Go right up to whatever the legal limit is in your region. For some lucky people in unregulated airspace, that might mean several thousand feet! *** A kite with twice the span and 4 times the sail area of the Dowel Barn Door. *** A 5-point bridle for extended wind range. *** When de-rigged and packed down, this kite is the same length as the Dowel Barn Door package! "I enjoy the site very much, and we love the Dowel Barn Door! ... It flew beautifully all of last summer."